2011 SIIT Research Award 2011. 2010 Distinguished Teacher Award, SIIT. 2010 Best Teaching Award, SIIT. 2008 Outstanding Teacher in Science and Technology Award, Thammasat University. 2006 Best Teaching Award, Sirindhorn International Institute of Technology. 2002 Best Teaching Award, Sirindhorn International Institute of Technology. Best Presenter-in-the-track Award, Automatic Control Conference, USA, 1998. Gold Medal Prize, 1993, Chulalongkorn University. Multidimensional systems and signal processing, Robust control, Image processing, Wavelet and filter bank, Signal processing for communication, Convolutional code design. Multidimensional signal processing has become more popular lately due to its efficiency and greater degree of freedom in the design. However, the design and analysis of multidimensional systems are generally more complicated and requires thorough understanding of abstract algebra. Applications of multidimensional DSP include image compression, video coding, multi-sensor system design, filter bank design and wavelet. Over several decades, great effort has been invested in the finding of a multivariate (n-D) polynomial matrix factorization algorithm. The problem has been completely solved only for the bivariate case. Recently with the usage of Groebner basis and conventional algebra, some n-D matrix factorization algorithms have been developed for some special cases. The general problem however, remains open. The solution to this problem will simultaneously solve many other important problems and can be directly applied to the multidimensional system realization and synthesis. Many signal processing techniques such as adaptive filtering and spectral analysis are used to improve the fidelity of the transmission and reception of digital signals. Unlike source coding, channel coding is used for the purpose of protecting the transmitted bit stream from erroneous receiving. Correction and detection of error bits by means of algebraic coding techniques such as 1-D and 2-D convolutional code are usually employed. Topics of interest include: adaptive filtering, power spectrum estimation, array processing, 2-D convolutional code design, and application-specific coding design. 2007 : Amnart Chaichoet. Implementation of Base Station Receiver in WCDMA System. Current : Ahmed Muflih. Study of Network Mobility and Route Optimization Problem. Current : Ekularn Dhavarudha. Cost and Performance Analysis of All Optical Network Switching: Optical Burst Switch (OBS) and Optical Circuit Switch (OCS). Current : Pramote Jangisarakul. Multidimensional Code Design and Its Related Issues. Current : Amnart Thamrongmas. Multidimensional Filters and Filter Bank Design Using Groebner Basis. C. Varojpipath; P. Chaichanamongkol; P. Mahitthiburin; P. Suksompong; and C. Charoenlarpnopparut (2018). "Enhancement of range-based 3D positioning via angle of arrival information," Proceedings of the 11th International Conference on Embedded Systems and Intelligent Technology (ICESIT 2018) in cooperation with The 9th International Conference on Information and Communication Technology for Embedded Systems (IC-ICTES 2018), 7-9 May 2018, Khon Kaen, Thailand, pp. 64-68. R. Manandhar; P. Suksompong; and C. Charoenlarpnopparut (2018). "Sidelobe reduction in a planar array using genetic algorithm under backlobe reduction condition," ECTI Transactions on Electrical Engineering, Electronics, and Communications, Vol. 16, No. 1, February 2018, pp. 1-8. P. Wangvongsathaphorn; C. Charoenlarpnopparut; P. Suksompong; H. Fujita; and J. Kudtongngam (2017). "The operation of provincial electricity authority’s SCADA," Proceedings of the 8th International Conference of Information and Communication Technology for Embedded Systems (IC-ICTES 2017), 7-9 May 2017, Chonburi, Thailand, pp. 171-175. S. Sirithawornsant; A. Niyomgool; P. Suksompong; and C. Charoenlarpnopparut (2017). "Fiber bragg grating FBG sensing temperature characteristic and application in water and air," Proceedings of the 14th International Conference on Electrical Engineering/Electronics, Computer and Information Technology (ECTI-CON 2017), 27-30 June 2017, Phuket, Thailand, pp. 705-707. A. Bhattarai; P. Suksompong; C. Charoenlarpnopparut; and P. Komolkiti (2017). "Counter-intuitive channel allocation improvement in distributed cognitive radio networks by adding optimal interference in user's utility," Proceedings of the 14th IEEE Annual Consumer Communications and Networking Conference (CCNC 2017), 8-11 January 2017, Las Vegas, United States, pp. 225-230. Md. M. Rahman; C. Charoenlarpnopparut; P. Suksompong; and P. Toochinda (2017). "Sensor array optimization for complexity reduction in electronic nose system," ECTI Transactions on Electrical Engineering, Electronics, and Communications, Vol. 15, No. 1, February 2017, pp. 49-59. Md. M. Rahman; C. Charoenlarpnopparut; P. Suksompong; P. Toochinda; and A. Taparugssanagorn (2017). "A false alarm reduction method for a gas sensor based electronic nose," Sensors, Vol. 17, No. 9, 12 September 2017, Article No.2089, 9 p.
W. Santipach; K. Mamat; and C. Charoenlarpnopparut (2016). "Outage bound for max-based downlink scheduling with imperfect CSIT and delay constraint," IEEE Communications Letters, Vol. 20, No. 8, August 2016, pp. 1675-1678. Md. M. Rahman; C. Charoenlarpnopparut; P. Suksompong; and A. Taparugssanagorn (2016). “Correlation coefficient based DVB-T continual pilot detection to identify spectrum hole for CR application,” Walailak Journal of Science and Technology, Vol. 13, No. 6 (Information Technology), June 2016, pp. 479-490. Md. M. Rahman; C. Charoenlarpnopparut; and P. Suksompong (2015). "Classification and pattern recognition algorithms applied to E-Nose," Proceedings of the 2015 2nd International Conference on Electrical Information and Communication Technology (EICT 2015), 10-12 December 2015, Khulna, Bangladesh, pp. 44-48. P. Jangisarakul and C. Charoenlarpnopparut (2015). "Algebraic decoding in two-dimensional linear codes," International Journal of Pure and Applied Mathematics, May 2015, Vol. 100, No. 3, pp. 391-403. Md. M. Rahman, C. Charoenlarpnopparut, and P. Suksompong (2015). "Signal processing for multi-sensor e-nose system: acquisition and classification," Proceedings of the 10th International Conference on Information, Communications and Signal Processing (ICICS 2015), 2-4 December 2015, Singapore, 5 p.
S. Thananchai; P. Suksompong; C. Charoenlarpnopparut; A. Taparugssanagorn; and Y. Katsunori (2015). "Application of reduced-complexity 3D indoor localization system in CDMA-based visible light communication system," Proceedings of the 2015 International Symposium on Multimedia and Communication Technology (ISMAC2015), 23-25 September 2015, Ayutthaya, Thailand, pp. 68-72. O. Poosri and C. Charoenlarpnopparut (2015). “Harmonics impact of rooftop photovoltaic penetration level on low voltage distribution system”, The 2015 7th International Conference on Mechanical and Electrical Technology (ICMET2015) [CD-ROM], Bali, Indonesia, 1-2 July 2015, Paper ID: TW043, 5 p.
P. Phukphan and C. Charoenlarpnopparut (2015). “Multi-path visible light communication channel model in an airplane cockpit”, The 3rd Annual Conference on Engineering and Information Technology (ACEAIT 2015) [CD-ROM], Osaka, Japan, 22-24 March 2015, Article No. ACEAIT-3710, pp. 271-282. S. Taiwal and C. Charoenlarpnopparut (2015). “Feasibility analysis of battery energy storage in power distribution system”, The 3rd Annual Conference on Engineering and Information Technology (ACEAIT 2015) [CD-ROM], , Osaka, Japan, 22-24 March 2015, Article No. ACEAIT-3648, pp. 139-148. E. Shinwasusin, C. Charoenlarpnopparut, P. Suksompong; and A. Taparugssanagorn (2015). “Modulation performance for visible light communications”, The 6th International Conference on Information and Communication Technology for Embedded Systems (IC-ICTES 2015) [CD-ROM], Prachuap Khiri Khan, Thailand, 22-24 March 2015, pp. 61-64. E. Dhavarudha, C. Charoenlarpnopparut, and S. Runggeratigul (2015). “Traffic control based on contention resolution in optical burst”, International Journal of Computers Communications and Control, February 2015, Vol. 10, No. 1, pp. 49-61. P. Hanpinitsak, C. Charoenlarpnopparut, and P. Suksompong (2014). “2D interleaver design for image transmission over severe burst-error environment”, ECTI Transactions on Electrical Engineering, Electronics, and Communications, 2014, Vol. 12, No. 2, pp. 55-63. T. Sauthananusuk, C. Charoenlarpnopparut, T. Kondo, P. Bunnun, and K. Hirohiko (2014). “Thai amulet recognition based-on texture feature analysis”, Annual Conference on Engineering and Technology (ACEAT 2014) [CD-ROM], Osaka, Japan, 15-17 October 2014, pp. 61-70. S. Chankaew and C. Charoenlarpnopparut (2014). “Two-dimensional finite impulse response zero-phase design based on a non-uniform frequency sampling method”, Suranaree Journal of Science and Technology, Vol. 21, No. 3, pp. 175-181. A. Thamrongmas, C. Charoenlarpnopparut, and P. Prempree (2014). “A novel design of IIR multiple notch filter based on an all-pass filter by using a pole-reposition technique”, ScienceAsia, October 2014, Vol. 40, No. 5, pp. 362-370. P. Jangisarakul and C. Charoenlarpnopparut (2014). “Decoding of 2-D convolutional codes based on algebraic approach”, International Journal of Pure and Applied Mathematics, Vol. 97, No. 1, pp. 21-30. K. Yongvanit, P. Suksompong, A. Taparugssanagorn, C. Charoenlarpnopparut, and K. Fukawa (2014). 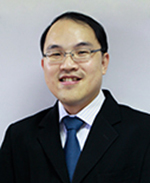 “Near-optimality of the one-step max-sum-rate precoder with MMSE initialization for large downlink multi-user MIMO systems”, The 20th Asia-Pacific Conference on Communications (APCC 2014) [CD-ROM], Chon Buri, Thailand, 1-3 October 2014, 5 p.
P. Meebunsmer and C. Charoenlarpnopparut (2014). "Forecasting of solar power plant production under the effect of weather condition", Regional Conference on Computer and Information Engineering 2014 (RCCIE 2014) [CD-ROM], Yogyakarta, Indonesia, 7-8 October 2014, pp. 229-233. A. Bhattarai, C. Charoenlarpnopparut, P. Suksompong, and P. Komolkiti (2014). "Developing policies for channel allocation in cognitive radio networks using game theory", 2014 11th International Conference on Electrical Engineering/Electronics, Computer, Telecommunications and Information Technology (ECTI-CON 2014) [CD-ROM], Nakhon Ratchasima, Thailand, 14-17 May 2014, Paper ID: 1267, 6 p.
P. Jangisarakul and C. Charoenlarpnopparut (2014). "Decoding matrix for two dimensional convolutional codes", The 2014 International Electrical Engineering Congress (iEECON 2014) [CD-ROM], Pattaya, Thailand, 19-21 March 2014, 4 p.
S. Chankaew and C. Charoenlarpnopparut (2014). "Reduction of block artifacts in DCT coded image using two dimensional notch filter", 2014 Annual Conference on Engineering & Information Technology (ACEAIT 2014) [CD-ROM], Tokyo, Japan, 28-30 March 2014, pp. 1031-1037. P. Prempree, P. Suksompong, C. Charoenlarpnopparut, and A. Taparugssanagorn (2014). "2-D Positioning based on passive RFID tags using multidimensional scaling", 2014 Annual Conference on Engineering & Information Technology (ACEAIT 2014) [CD-ROM], Tokyo, Japan, 28-30 March 2014, pp. 1007-1017. T. Wattanaphong, C. Charoenlarpnopparut, and T. Isshiki (2014). "Real-time acquisition for microscopic image analysis", 2014 Annual Conference on Engineering & Information Technology (ACEAIT 2014) [CD-ROM], Tokyo, Japan, 28-30 March 2014, pp. 255-263. K. Yongvanit, P. Suksompong, A. Taparugssanagorn, C. Charoenlarpnopparut, and K. Fukawa (2014). "Performance analysis of iterative max-sum-rate algorithm in massive MIMO systems", The International Conference on Information and Communication Technology for Embedded Systems (ICICTES2014) [CD-ROM], Ayutthaya, Thailand, 23-25 January 2014, 4 p.
T. Sauthananusuk, C. Charoenlarpnopparut, T. Kondo, P. Bunnun, and K. Hirohiko (2014). "Thai Amulet recognition using simple feature", The International Conference on Information and Communication Technology for Embedded Systems (ICICTES2014) [CD-ROM], Ayutthaya, Thailand, 23-25 January 2014, 5 p.
Md. M. Rahman, C. Charoenlarpnopparut, P. Suksompong, and A. Taparugssanagorn (2013). "Spectrum hole identification in multiple TV bands by adaptive threshold multi-taper spectrum estimator for cognitive radio", The 1stInternational Conference on Electrical Information and Communication Technology (EICT 2013) [CD-ROM] , Khulna, Bangladesh, 13-15 February 2014, pp. 317-322. Md. M. Rahman, C. Charoenlarpnopparut, P. Suksompong, and A. Taparugssanagorn (2013). "Autocorrelation ? MTM: a compound detector for spectrum hole identificaition in low SNR", The 1st International Conference on Electrical Information and Communication Technology (EICT 2013) [CD-ROM], Khulna, Bangladesh, 13-15 February 2014, pp. 294-298. T. Sangyam, C. Charoenlarpnopparat, P. Suksompong, K. Kaemarungsi, and K. Fukawa (2013). "Capacity maximization via selection of uniformly distributed user for uplink MIMO communication over η-μ fading channel", The Second Asian Conference on Information Systems (ACIS 2013) [CD-ROM], Phuket, Thailand, 31 October ? 2 November 2013, pp. 521-525. T. Sansanayuth, P. Suksompong, C. Charoenlarpnopparut, and A. Taparugssanagorn (2013). "RFID 2D-localization improvement using modified LANDMARC with linear MMSE estimation", The 13th International Symposium on Communications and Information Technologies (ISCIT 2013) [CD-ROM], Surat Thani, Thailand, 4-6 September 2013, pp. 133-137. T. Kiatdarakun, P. Suksompong, C. Charoenlarpnopparut, and A. Taparugssanagorn (2013). "3-D localization algorithm using double-planar passive RFID arrays", The 13th International Symposium on Communications and Information Technologies (ISCIT 2013) [CD-ROM], Surat Thani, Thailand, 4-6 September 2013, pp. 96-100. N. Piyachaiyakul and C. Charoenlarpnopparut (2013). "Design of three-dimensional adaptive IIR notch filters",Multidimensional Systems and Signal Processing, Vol. 24, No. 3, September 2013, pp. 435-446. S. Umpavan and C. Charoenlarpnopparut (2013). "Improved two-dimensional adaptive IIR notch filter with two-level sub-band filtering and variance thresholding technique", International Conference on Electrical Engineering and Computer Sciences (ICEECS) [CD-ROM], Tokyo, Japan, 15-17 March 2013, pp. 1201-1207. C. Charoenlarpnopparut, S. Suprasongsin, P. Jangisarakul, and A. Thamrongmas (2013). "Performance evaluation of image transmission system with two-dimensional linear block code and interleaver", The International Conference on Information and Communication Technology for Embedded Systems (ICICTES 2013) [CD-ROM], Samutsongkhram, Thailand, 24-26 January 2013, pp. 174-177. P. Hanpinitsak, C. Charoenlarpnopparut, S. Thananchai, and P. Suksompong (2013). "2D MIMO-OFDM channel model with 2D interleaver", The International Conference on Information and Communication Technology for Embedded Systems (ICICTES 2013) [CD-ROM], Samutsongkhram, Thailand, 24-26 January 2013, pp. 190-194. T. Sangyam, C. Charoenlarpnopparut, P. Suksompong, K. Kaemarungsi, and K. Fukawa (2012). "Performance of uplink multi-user MIMO WiFi with capacity maximizing user selection and uniformly distributed user locations", The Third International Conference on Information and Communication Technology for Embedded Systems (ICICTES2012)[CD-ROM], Bangkok, Thailand, 22-24 March 2012, 6 p.
T. Bamrungkitjaroen, P. Suksompong, and C. Charoenlarpnopparut (2012). "Application of a pipelining technique in concatenated Tomlinson Harashima precoder for downlink multiuser MIMO systems", Thammasat International Journal of Science and Technology, Vol. 17, No. 2, April-June 2012, pp. 1-12. P. Hanpinitsak and C. Charoenlarpnopparut (2012). "2D interleaver design for image transmission over severe burst-error environment", International Journal of Future Computer and Communication: Proceedings of the 2012 International Conference on Communication and Computer (ICNCC 2012), Hong Kong, 29-30 December 2012, Vol. 2, No. 4, August 2013, pp. 308-312. T. Bamrungkitjaroen, P. Suksompong, C. Charoenlarpnopparut, K. Kaemarungsi, and K. Fukawa (2012). "Application of pipelining technique in concatenated Tomlinson Harashima precoder for downlink multiuser MIMO systems", The Third International Conference on Information and Communication Technology for Embedded Systems (ICICTES2012)[CD-ROM], Bangkok, Thailand, 22-24 March 2012, 6 p.
T. Bamrungkitjaroen, P. Suksompong, C. Charoenlarpnopparut, K. Sripimanwat, and K. Fukawa (2011). "Application of pipelining technique in concatenated Tomlinson Harashima precoder for downlink MIMO systems", Asia Simulation Conference 2011 (AsiaSim2011), Seoul, Korea, 16-18 November 2011, pp. 180-189. N. Piyachaiyakul and C. Charoenlarpnopparut (2011). "Nonseparable three-dimensional IIR notch filter design using outer product expansion", IEEE Transactions on Circuits and Systems?II: Express Briefs, September 2011, Vol. 58, No. 9, pp. 605-609. E. Dhavarudha, C. Charoenlarpnopparut, and S. Runggeratigul (2011). "Performance and cost analysis of all-optical switching: OBS and OCS", Songklanakarin Journal of Science and Technology, July - August 2011, Vol. 33, No. 4, pp. 459-460. N. Piyachaiyakul and C. Charoenlarpnopparut (2011). "Sub-band IIR Adaptive Notch Filter with variance thresholding",The 30th JSST Annual Conference (JSST 2011) International Conference on Modeling and Simulation Technology [CD-ROM], Tokyo, Japan, 22-23 October, 2011, 4 p.
A. Thamrongmas and C. Charoenlarpnopparut (2011). "All-pass based IIR multiple notch filter design using Gröbner basis", The 7th International Workshop on Multidimensional (nD) Systems (nDS11) [CD-ROM], Poitiers, France, 5-7 September 2011, 6 p.
N. Piyachaiyakul and C. Charoenlarpnopparut (2011). "Analytical sub-band filtering technique of two-dimensional adaptive notch filter", The 7th International Workshop on Multidimensional (nD) Systems (nDS11) [CD-ROM], Poitiers, France, 5-7 September 2011, 6 p.
P. Jangisarakul and C. Charoenlarpnopparut (2011). "Algebraic decoder of multidimensional convolutional code: constructive algorithms for determining syndrome decoder and decoder matrix based on Gröbner basis",Multidimensional Systems and Signal Processing, March 2011, Vol. 22, Nos. 1-3, pp. 67-81. S. Phongsuwan, T. Sitthiwongwanich; A. Thamrongmas; and C. Charoenlarpnopparut (2011). "Multiple IIR notch filter design and optimization by secant approximation", The 8th Electrical Engineering/Electronics, Computer, Telecommunications and Information Technology (ECTI) Association, Thailand ? Conference (ECTI-CON 2011) [CD-ROM], Khon Kaen, Thailand, 17-19 May 2011, pp. 971-974. A. Kassanook, P. Boonyanant, C. Charoenlarpnopparut, and A. Nishihara (2010). "Simulation of rounding threshold and microrotation for punctured Radix-8 CORDIC to reduce hardware complexity with low latency", The 1st International Conference on Computational for Science and Technology, Chiang Mai, Thailand, 4-6 August 2010, pp. 32-37. A. Kassanook, P. Boonyanant, C. Charoenlarpnopparut, and A. Nishihara (2010). "Punctured radix-8 CORDIC and condition of selection to reduce hardware complexity with low latency", The International Conference on Information and Communication Technology for Embedded Systems 2010 (ICICTES 2010) [CD-ROM], Pathum Thani, Thailand, 28-30 January 2010, 4 p.
S. Mahapakulchai and C. Charoenlarpnopparut (2009). "MAP source-controlled channel decoding with interleavers for MPEG-4 image indoor wireless transmission systems", IEICE Transactions on Communications, October 2009, Vol. E92-B, No. 10, pp. 1-8. C. Charoenlarpnopparut (2009). "Applications of Gröbner bases to the structural description and realization of multidimensional convolutional code", ScienceAsia: Journal of the Science Society of Thailand, March 2009, Vol. 35, No. 1, pp. 95-105. A. Limmanee and C. Charoenlarpnopparut (2009). "Design of power spectrum density monitoring system using optimal sliding exponential window technique", Suranaree Journal of Science and Technology, January-March 2009, Vol. 16, No. 1, pp. 9-18. S. Mahapakulcha, C. Charoenlarpnopparut, and S. Hasajitto (2009). "Mismatched source transition probability matrix for adaptive MAP decoding in MPEG-4 imagery wireless transmission systems", The 20th Personal, Indoor and Mobile Radio Communications Symposium 2009 [CD-ROM], Tokyo, Japan. 13-16 September 2009, 5 p.
C. Charoenlarpnopparut, P. Charoen, A. Thamrongmas, S. Samurpark, and P. Boonyanant (2009). "High-quality factor, double notch, IIR digital filter design using optimal pole re-position technique with controllable passband gains", The 6th International Conference on Electrical Engineering/Electronics, Computer, Telecommunications, and Information Technology (ECTI-CON 2009) [CD-ROM], Pattaya, Thailand, 6-9 May 2009, Vol. 2, pp. 1163-1166. S. Tantaratana, C. Charoenlarpnopparut, P. Boonyanant, and Y. C. Lim (2009). "IIR Filters", The Circuits and Filters Handbook: Passive, Active and Digital Filters, edited by Chen, Wai-Kai, CRC Press, 2009, pp. 19-1 to 19-45. A. Chaichoet and C. Charoenlarpnopparut (2008). "New approaches to improve WCDMA SIR estimator by employing different post-processing stages", Songklanakarin Journal of Science and Technology, November-December 2008, Vol. 30, No. 6, pp. 775-785. A. Thamrongmas and C. Charoenlarpnopparut (2008). "Finite support 2-D FIR QMF PR filter bank design by spectral factorization using Gröbner basis". The 14th Asia-Pacific Conference on Communications (APCC2008) [CD-ROM], Tokyo, Japan, 14-16 October 2008, 5 p.
C. Charoenlarpnopparut and P. Jangisarakul (2008). "Constructive algorithms for determining inverses and syndrome matrices of multidimensional convolutional encoders using the Gröbner basis approach", The 14th Asia-Pacific Conference on Communications (APCC2008) [CD-ROM], Tokyo, Japan, 14-16 October 2008, 4 p.
P. Jangisarakul and C. Charoenlarpnopparut (2007). "Finite element method with edge elements for anisotropic waveguide problems", Suranaree Journal of Science and Technology, October- December 2007, Vol. 14, No. 4, pp. 309-321. C. Charoenlarpnopparut (2007). "One-dimensional and multidimensional spectral factorization using gröbner basis approach", Asia-Pacific Conference on Communications 2007 (APCC 2007) [CD-ROM], Bangkok, Thailand, 18-20 October 2007, pp. 201-204. P. Chanapaitoon, S. Kumpituck, T. Chintana, and Chalie Charoenlarpnopparut (2007). "Two-dimensional diamond-shape linear phase perfect reconstruction FIR filter bank design using Gröebner basis approach", International Conference on Engineering Applied Sciences, and Technology (ICEAST 2007) [CD-ROM], Bangkok, Thailand, 21-23 November 2007, pp. 37-40. T. Phoopattanakul; W. Saenghiranwattana K. Ruangsa-ad; Chalie Charoenlarpnopparut; and P. Boonyanant (2007). "Adaptive channel equalizer design for uplink WCDMA rake receiver", The 2007 Electrical Engineering/Electronics, Computer, Telecommunications and Information Technology (ECTI) International Conference [CD- ROM], Chiang Rai, Thailand, 9-12 May 2007, pp. 691-694. A. Chaichoet and C. Charoenlarpnopparut (2006). "Design and performance evaluation of uplink WCDMA receiver based on WMSA algorithm", The 2006 Electrical Engineering/Electronics, Computer, Telecommunications and Information Technology (ECTI) International Conference (ECTI-CON 2006) [CD-ROM], Ubon Ratchathani, Thailand, 10-13 May 2006, pp. 287-290. C. Charoenlarpnopparut, D. Wangrattanapranee, and S. Jiebna (2006). "Design of uplink WCDMA channel equalizer using block LMS algorithm", The International Symposium on Communications and Information Technologies 2006 (ISICT 2006) [CD-ROM], Bangkok, Thailand, 18-20 October 2006, Paper No. W3F-3, 4 p.
E. Dhavarudha, C. Charoenlarpnopparut, and S. Runggeratigul (2006). "Performance and cost comparison for optical burst switching and optical circuit switching" The International Symposium on Communications and Information Technologies 2006 (ISICT 2006) [CD-ROM], Bangkok, Thailand, 18 -20 October 2006, Paper No. T4F-4, 5 p.
W. Intato, I. Leelertyanon, V. Areekul, C. Charoenlarpnopparut, and S. Tantaratana (2006). "Improvement of slot synchronization process in WCDMA system by using realibility measurement parameter", The 2006 Electrical Engineering/Electronics, Computer, Telecommunications and Information Technology (ECTI) International Conference (ECTI-CON 2006) [CD-ROM], Ubon Ratchathani, Thailand, 10-13 May 2006, pp. 283-286. A. Chaichoet, C. Charoenlarpnopparut, A. Prompijit, K. Palungvitvatana, and N. Nualplaud (2005). "Approaches to improve WCDMA adaptive SIR estimator by LMS algorithm and IIR post filtering", The 2005 Electrical Engineering/Electronics, Computer, Telecommunications and Information Technology (ECTI) International Conference (ECTI-CON 2005) [CD-ROM], Pattaya, Thailand, 12-13 May 2005, pp. 434 -437. C. Charoenlarpnopparut (2005). "Optimal minimax control solution using rate feedback", The 2005 Fifth International Conference on Information, Communications and Signal Processing (ICICS 2005) [CDROM], Bangkok, Thailand, 6-9 December 2005, pp. 474-476. S. Naramonthon, T. Kondo, and C. Chareonlarpnopparut (2005). "An integrated approach to classification of rice grains", The Asia-Pacific Workshop on Visual Information Processing (VIP 2005), Hong Kong, 11-13 December 2005, pp. 254-257. W. Thanhikam, Y. Satirasombat, and C. Charoenlarpnopparut (2005). "Voice authentication system: LPC and mel-ceptrum bases with vector quantization", In Proceedings of the 2005 Electrical Engineering/Electronics, Computer, Telecommunications and Information Technology (ECTI) International Conference (ECTI-CON 2005) [CD-ROM], Pattaya, Thailand, 12-13 May 2005, pp. 107-110. W. Khetpiboonchai, V. Sirivoraluk, and C. Charoenlarpnopparut (2005). "A practical approach to compare the performance of one- and multi-dimensional convolutional codes", The 2005 Electrical Engineering/Electronics, Computer, Telecommunications and Information Technology (ECTI) International Conference (ECTI-CON 2005) [CD-ROM], Pattaya, Thailand, 12-13 May 2005, pp. 299-302. C. Charoenlarpnopparut and S. Tantaratana (2004). "Algebraic approach to reduce the number of delay elements in the realization of multidimensional convolutional code", The 47th IEEE International Midwest Symposium on Circuits and Systems (MWSCAS 2004), Hiroshima, Japan, 25-28 July 2004, pp. II-529 - II-532. C. Charoenlarpnopparut, C. Clungnooch, and C. Rosjan (2004). "Improved adaptive W- CDMA SIR estimator with post-processing", The First Electrical Engineering/Electronics, Computer, Telecommunications, and Information Technology (ECTI 2004) Annual Conference, Pattaya, Thailand, 13-14 May 2004, pp. 50-53. C. Charoenlarpnopparut and S. Tantaratana (2003). "Multidimensional convolutional code: progresses and bottlenecks", The 2003 IEEE International Symposium on Circuits and Systems (ISCAS 2003) [CD-ROM], Bangkok, Thailand, 25-28 May 2003, pp. III-686 to III-689. C. Charoenlarpnopparut, S. Wongsura, and A. Davies (2003). "Direct realization of a 2-D convolutional encoder with lesser number of delay elements", The Third International Symposium on Communications and Information Technology (ISCIT 2003) [CD-ROM], Songkhla, Thailand, 3-5 September 2003, Vol. I, pp. 258-262. C. Charoenlarpnopparut (2002). "Robust stability of perturbed plant by a fixed compensator", The Second International Symposium on Communications, and Information Technology, Pattaya, Thailand, 23- 25 October 2002, pp. 408-411. C. Charoenlarpnopparut and N. K. Bose (2001). "Groebner bases for problem solving in multidimensional systems",Multidimensional Systems and Signal Processing, July 2001, Vol. 12, No. 3, pp. 365-376. C. Charoenlarpnopparut, and N.K. Bose (1999). "Multidimensional Filter Bank Design Using Groebner Bases", IEEE Transactions on Circuits and Systems II: Analog and Digital Signal Processing, 1999, Vol. 46, No. 12. N.K. Bose and C. Charoenlarpnopparut (1999). "Groebner Bases for Robust Control", International Workshop: Control of Uncertain Systems: Emerging Directions, Hong Kong University of Science and Technology, 30 June - 2 July 1999. N.K. Bose and C. Charoenlarpnopparut (1999). "Minimax Controller Design Using Rate Feedback", Circuits Systems and Signal Processing, 1999, Vol. 18, No. 1, pp. 17-25. N.K. Bose and C. Charoenlarpnopparut (1999). "Minimax Controller Using Rate Feedback: Latest results", 14th World Congress of International Federation of Automatic Control, IFAC-99, Beijing, China, 5 - 9 July 1999, Vol. G, pp. 525-530. N.K. Bose and C. Charoenlarpnopparut (1998). "Multivariate Matrix Factorization: New Results", Mathematical Theory of Networks and Systems Symposium, MTNS-98, Padova, Italy, 6 - 10 July 1998, pp. 97-100. N.K. Bose and C. Charoenlarpnopparut (1998). "Test for Nonnegativity of Polynomials with Literal Coefficients by Quantifier Elimination", American Control Conference, Philadelphia, USA, 24 - 26 June 1998, pp. 1879- 1880.